What do you most love about orthodontics? I’m a people person – so I love the daily interaction and chats with patients. 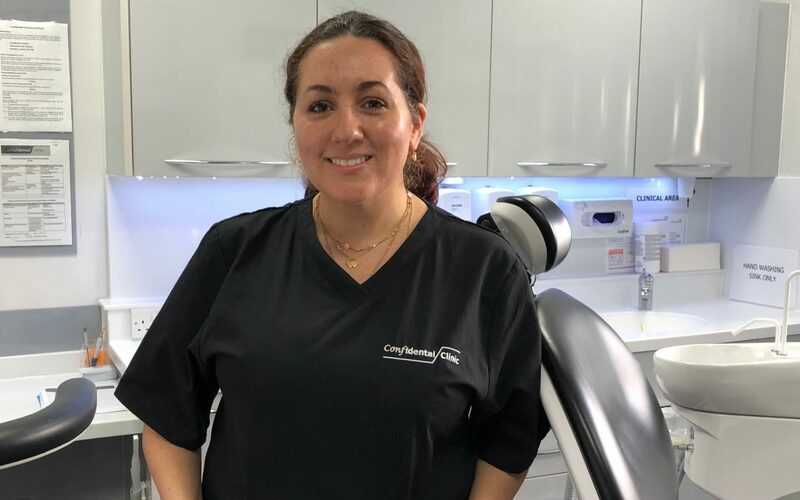 Since in orthodontics we see our patients every 6 weeks, I build up a rapport with them, they become like friends and most importantly I love the impact they say treatment has had on their lives. I also love the practical aspect of the job, I’m an avid head planner, but in reality, my life can be a bit manic, so orthodontics gives me a sense of calm when my mechanics plan for the teeth and occlusion all comes together! You have recently had orthodontic treatment yourself, has this experience changed the way you work with patients? I have way more empathy now for the pain!! I understand that those first few days do bloody hurt. But I also do wonder how on earth patients break their braces, I ate pretty much everything and didn’t break my brace once, so I now have less tolerance for breakages! If this is the first time you have had braces, how did you find the experience? I actually had an old school removable appliance with serial extractions as a child- I’m now showing my age, such unfashionable treatment now! I also had a lower fixed brace, but I wasn’t given retainers so I had some minor relapse. So this time I was keen to get my lower teeth aligned and most importantly retain them. I was surprised how itchy my teeth and gums felt! Yes, itchy! It was infuriating, but it meant I was extra strict with my hygiene. How compliant are you with wearing your retainers and what advice would you give to patients who may have been a little forgetful? I’m extremely compliant with my retainers, I’ve had treatment twice now, I don’t want them to move again, it’s part of my night time routine, and so easy to do but also I can’t actually sleep without them! The couple of times I have forgotten to take them with me on a weekend away, I have panicked slightly – but it wasn’t a big deal, as soon as I returned I put my retainers in full time, they reassuringly still fit, albeit tightly but once that subsided I went back to night time wear. Anyone who does forget, don’t sabotage the whole game and think since they are so tight I won’t bother anymore, get back on it with full-time wear and they should settle back into place. But of course, if you’re unsure contact your orthodontist. What makes a great patient? So a baseline good patient would be someone who attends regularly, maintains good hygiene and is compliant with elastic wear. But to be promoted to a great patient, I’d say have realistic expectations and remember that we’re not playing with photoshop and that sometimes you have to just listen to your body and do what is best for your health. What do patients most enjoy about visiting your practice? I hope that they feel it’s relaxed, a lot of people have worries from bad experiences in the past or just the idea of someone looking in the mouth makes them break out in a sweat; but I hope I make them feel at ease. I talk A LOT during the appointment and often while their mouth is wide open, and it’s not just because I feel like a chat with my nurse, it’s mainly to distract them from all the sounds smells and sights that are going on and before they know it, they’re done! Do dental staff make good patients? Hmm I’ve treated my own staff before, they were fab, but I’ve treated people who used to work in the field and now have lost touch, and a little knowledge can be a scary thing! How can patients speed up their treatment? There’s been a lot of talk about devices to help the teeth move faster, but the reality is that there isn’t the scientific evidence to support this. I’d say compliance is key- attending appointments, wearing your elastics or aligners as instructed, and avoiding breaking your brace. What type of orthodontic cases do you most enjoy working on and why? I like a challenging case that needs lots of different mechanics, I often go back to my basic training and think of how I’d answer an exam question on the case and then I’ll come up with a neat plan. I don’t know if I’m a typical orthodontist- but my day always starts with a cuddle/alarm clock from my 5-year-old, a shower, coffee and dash out the door. I work in 3 different practices so sometimes I need to remember what day it is, to work out where I’m going. I use my commute to catch up on emails/ social media, or listening to radio 4 if I’m driving. I’m at work by 8.30 and I crack on with my day list. I like that my diary is varied and no day is the same. I’m usually booked back to back with new patients; which is a fact-finding appointment, adjustments of existing braces, fitting of new braces, and removal of braces. These are the ones I’m most nervous about because I always worry that if I’m not completely satisfied then I’ll have to break the bad news of the delay in taking the brace off! I can be a bit of a perfectionist about certain aspects, but on the other hand, I’m realistic to what are feasible movements and I give my patients as much information about their treatment so we can make decisions together. I almost always break for lunch, I need my energy to keep the hype going! I like to catch up with the rest of the team over lunch, we don’t just work together we are like family. Every day is different, and I’m usually frazzled by the end. I fly out the door as soon as I can to get home to my family, often my husband has already cooked but sometimes I get the chance to experiment on the evening meal. I attempt to get my daughter to read and get on with the whole bath & bedtime routine. On Thursday evenings I work until 8 pm, this is actually my excuse to get out of doing bedtime! I try to do a yoga class once a week but often I rely on the weekend to get some exercise in. I spend longer than I wish to admit on social media and relaxing in front of the TV before I drag myself to brush & floss and of course click my retainers in and collapse into bed, ready to start it all again. What meal would you cook for someone who has just had their braces fitted? Definitely a wholesome chicken and vegetable soup; comforting but packed full of goodness, and soft enough so no chewing is involved. What advice would you give to someone who is thinking about getting braces? Think long and hard, it’s a commitment. Don’t do it on a whim. The patients who do well with their treatment really want it. And they cope with the initial issues because they have an aim. Once you decide to do it and get accustomed to your brace you’ll be so glad you made the decision to do it! Broken brackets and wires are most often caused by…? What would you be if you weren’t an orthodontist? Something that involves food( preferably me eating it! ), but also allows me the freedom to do the school run. My husband and I always joked that we’d one day open a coffee & burger joint, sounds awful once you write that down. Hmm maybe I’ll stick to teeth. A huge thank you to Cleo for taking part in this interview. If you would like to be featured in a future ‘a coffee with..’ or would like to support my blog, please get in touch.